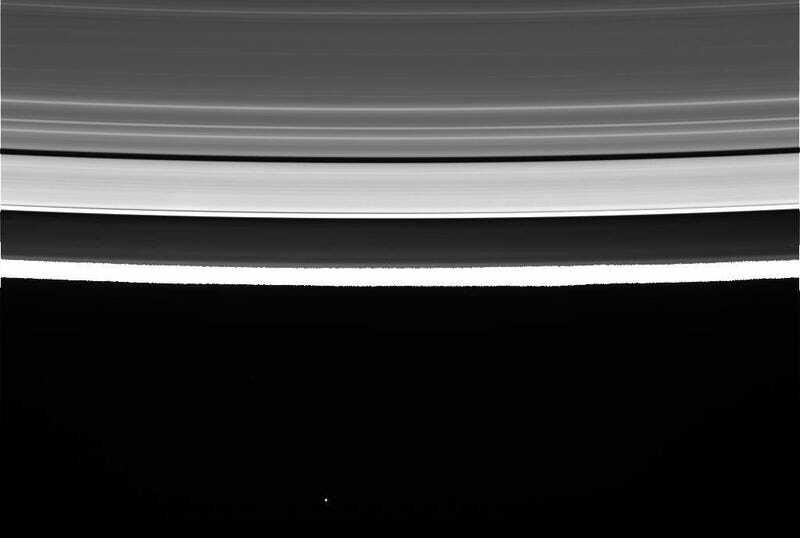 Cassini's First Grand Finale Images Are Stunning—But What Are We Really Looking At? It was 11:56 pm Wednesday night when a Deep Space Network receiver picked up a signal from NASA’s Cassini orbiter as it emerged from its first trip through the gap between Saturn and the gas giant’s rings. In the ensuing data came pictures of the planet’s north pole and cloud tops from only 1,800 miles (3000 kilometers) away—our closest look yet at the upper part of Saturn’s atmosphere, where the pressure is about the same as it is at sea level on Earth. Researchers at the Jet Propulsion Laboratory were awestruck by the detail, but I was left with a question: What would it be like to actually visit the upper reaches of Saturn’s skies? What initially caught my attention in the new images were the bright spots dotting the thin bands across the planet’s face. My assumption was that these were potential flickers of lightning captured by Cassini’s Imaging Science Subsystem Wide Angle Camera, but no. “We didn’t catch any lightning [on Wednesday night],” Caltech professor Andy Ingersoll, an expert in planetary atmospheres, told me when I called him to discuss the Saturnian weather I’d need to pack for. According to Ingersoll, the lighter blobs pictured above are clouds of ammonia floating about 93 miles (150 kilometers) atop the next closest layer of the atmosphere. If you were suspended in a hydrogen balloon (not helium, as a helium balloon in a hydrogen atmosphere would “sink like a rock,” Ingersoll said), these ammonia clouds would look very similar to our water vapor cumulus clouds here on Earth. “There probably are clouds of water vapor down deeper but we can’t see them as well because it’s frozen. The water [freezes] at greater depth than the ammonia,” said Ingersoll. “So, we typically see ammonia clouds and that’s what I think these are, as warm air rises up and condenses out cloud particles.” Warm, it should be noted, is a relative term—temperatures average -270 Celsius in Saturn’s upper atmosphere, so bring a coat. On Wednesday night, Cassini captured a series of photos that began with the spinning gyre in the center of Saturn’s north pole hexagon. Traveling southward, it eventually flew by the equator at a brisk 77,000 miles per hour (124,000 kph). If the camera was shooting in color, we would have seen the cerulean blue of the north pole’s inner vortex, but the spacecraft’s speed required monochrome photography. That could have something to do with another phenomenon Ingersoll observed: The stringy clouds were very orderly, as if nothing was disturbing the air, despite the fact that winds on Saturn reach up to 1,100 miles per hour (1,800 kph). That could speak to a fundamental aspect of the outer planets’ atmospheres. Wednesday night’s close brush with Saturn was just the first of the 22 passes scheduled before Cassini’s final descent this September, but it’s only one of three or four where visual light data will be collected. What Ingersoll is looking forward to in future flybys are readings that pierce through the upper cloud layer and into the depths of the planet. Magnetic, infrared and microwave sensors will be pointed at Saturn on future flybys, cutting through the opaque cloud cover and into the gas giant’s core to get our best view yet of the structure of the planet. Ingersoll mentioned the final Grand Finale observation he was looking forward to most at the very end of our conversation, which could solve an ongoing mystery of the planet’s formation. Saturn’s magnetic field has a very unusual property in that it’s “axisymmetric”—it has no tilt. That’s weird, because the math behind planetary magnetic fields requires a bit of tilt. “How does a planet generate a magnetic field? The off-axis tilt is sort of part of that whole theory and if there’s no tilt at all, well, it will be interesting,” he said with a chuckle. Bryson is a freelance storyteller who wants to explore the universe with you.